1. 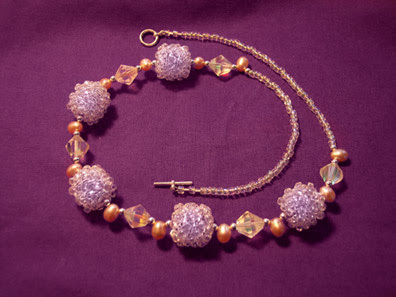 Pick up 1 size 8/0 seed bead and 2 size 11/0 delicas, five times. 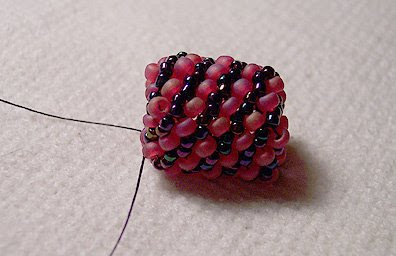 Pass the thread through all the beads again and tie a knot so that you have a tight circle of beads. 2. Pick up 1 size 8/0 and 2 size 11/0s, and pass the needle and thread through the 2 size 11/0s of the previous row. 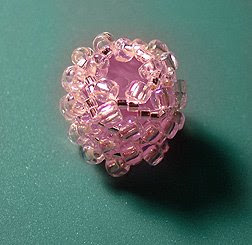 Continue, allowing the bead to spiral until it is as tall as desired. Slip the resin bead in at any point. 3. Tighten down the last row by adding only a size 8/0 and passing through the 2 size 11/0s of the previous row five times. pass through all the beads in that last row again and pull snug. 4. Work the thread back down to the bottom to tie off with the other end. String ‘em up as you please! Copyright 2008 Cyndi Lavin. Not to be reprinted, resold, or redistributed for profit. May be printed out for personal use or distributed electronically provided that entire file, including this notice, remains intact. It's helpful that you give exact counts of the seed beads, but unless I'm missing something, I'm not sure what size the "core" bead ought to be. Anybody know this one? The drum beads that I used for the core are 10 mm across. They are a tiny bit taller than they are wide, but the size actually varies a bit since they are cottage industry beads from overseas. I got them from Rings & Things. Thanks for sharing... I wished i had discovered how much fun beading when I was younger. I knew how to peyote stitch decades ago but I had other interests at the time and nowadays am loving it. I still need to learn other techniques. Thanks again!